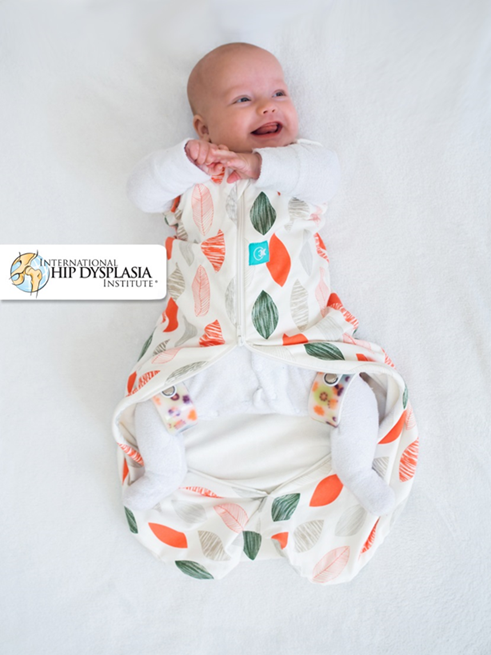 Award-winning manufacturer ergoPouch’s range of baby swaddles, sleep sacks and sleep suits have received “hip-healthy” designation from The International Hip Dysplasia Institute (IHDI). Australian-based ergoPouch is renowned for the design and manufacture of premium baby swaddles, sleeping bags and sleep suits made from pure natural fibers. The International Hip Dysplasia Institute (IHDI) is a not-for-profit organization dedicated to improving the health and quality of life of those afflicted with hip dysplasia. His article highlighted potential issues associated with the traditional wrapping method — parents can end up wrapping too tightly to ensure their babies stay securely swaddled. Wraps can tend to unravel, but it is really important to avoid wrapping a baby’s legs tightly in a straight (prone) position. There is no origami and no wrapping involved when using an ergoCocoon or AirCocoon, they keep even the most determined Houdini babies snug! For this reason the International Hip Dysplasia Institute (IHDI) has recognized these products as “Hip-Healthy”. ErgoPouch products are ergonomically designed with a bell-shaped bottom for extra legroom and made from stretchy organic cotton or bamboo to allow babies to move their legs comfortably and adopt the ‘frog-leg’ position. They are perfect for babies diagnosed with hip dysplasia as a brace can be worn comfortably inside the swaddle. ErgoPouch also offers different sizes to ensure the right fit for baby. Melbourne, Australia-based ergoPouch was founded in 2009 by Alina Sack. As a mother, Sack drew on her own personal experiences of sleep deprivation to come up with innovative products designed to help babies and kids get a better night’s sleep. The award-winning ergoPouch collection includes premium quality baby swaddles, sleeping bags and sleep suits available from birth to 6 years of age sizing. All ergoPouch products are made with pure natural fibers including Organic Cotton, Bamboo and Merino. ergoPouch products offer great functionality and versatility with swaddles that can easily transition to a sleeping bag, and sleep suits that convert from bags to suits with legs for easy use from bassinet to stroller to baby carrier. For more information visitwww.ergopouch.com.